Z-Stream is a great program, but how do you know it’s appropriate for your business? 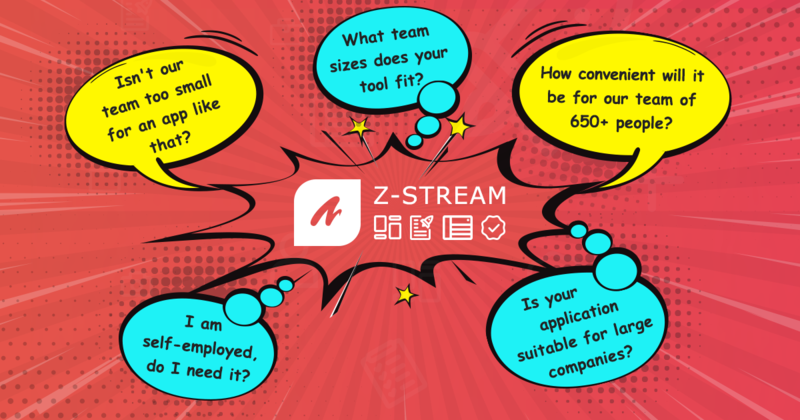 In fact, some of the most common questions we hear are “Is Z-Stream suitable for my small business?”, “Would Z-Stream be right for my big team?”, “I’m self-employed, how can I benefit from the app?” and questions to that effect. Whether you are a freelancer, or have a small, medium-sized or big business, there’s good news: Z-Stream is designed to be as simple or as complex as you need it to be depending on the range of tasks your team needs to solve, which makes our software suitable for companies of a wide range of sizes and types. Your team doesn’t want to spend half their time figuring out how to use their project management software! An intuitive interface and user-friendly design will allow users to quickly create tasks and monitor the entire process without the need to spend excessive amounts of time just figuring out how the app works. This is particularly beneficial to small businesses, who may need to move through their tasks quickly. You can create different products through Z-Stream that include releases, sprints, and tasks. All of these features can be shared with your clients at your discretion. As a result, they’ll be able to collaborate with you more effectively throughout the process. This is a great way to grow your credibility as an individual service provider or a small team, establish close rapport with the client, and organize your processes up to scratch. Not sure that Z-Stream is right for you? Try the free version to get to know more about the program. This will give you a chance to figure out the basics of the app and make sure that it’s exactly what you need. When you are ready to switch to the full version, the price is set at a point that is affordable for small businesses and small teams. You may need accountability that will show you exactly what you did each day: which projects you were working on, which tasks you got done, and more. With Z-Stream, work logging is a simple step that you can complete at the end of each day. Besides, Z-Stream can be a handy time-management tool with extended functionality for busy freelancers that need to organize their day-to-day workload. The reports tab instantly gives you all the information about your products. A report can be generated and sent to clients in one click, never requiring you to leave the page. This makes report generating an easy part of your day, rather than a task that can take hours. Your reports will contain all the information the client needs, whether you choose to provide them with access to the app or to hand over the report alone. No matter where you are or what you’re doing, you need to be able to keep up with your team. With both mobile and web versions of Z-Stream, you can track your team’s progress even when you’re on the go, on the road, and more. This is particularly important when you’re managing a small team, since there aren’t other managers to step in for you when you have to head out to work on other projects or take care of other tasks. Small distributed teams or a group of individuals sharing a project can benefit from the flexibility of remote teamwork Z-Stream offers. Z-Stream is an all-in-one tool that keeps everything in place. No more time wasted putting together big tables, managing additional services, and struggling with potential data mix-ups. Z-Stream streamlines data gathering, management, and assessment. It’s suitable for employees of all levels: CEOs down to freelance employees. This makes it easier than ever to keep up with all of your projects. Z-Stream is a true all-in-one solution for all of your business’s needs. When you’re partnering with multiple entities on major projects, you need a collaboration tool that is easy to pull together. With Z-Stream, you can easily create several different companies and share the with partners. This makes it easy to collaborate with them at the same time, all from one convenient platform that’s easy for all of your partners to understand and use. You’ve got any number of projects going all at the same time, and they all need to be run efficiently. With Releases and Sprints, you can easily plan the development process and structure the workload right in the tool. A Gantt chart will give you a timeline of your work plan and list all of your sprints and milestones throughout the development cycle so that you can easily view the progress your team is making, what you still need to accomplish, and other key information about each project at a glance. This makes planning for your projects much easier, even when you need to shift staff around to accommodate large projects. Keeping track of workflow is an important task for your company. You want to make sure that your employees are functioning efficiently and effectively. With the Product line, you’re able to organize all of your work processes. For companies with multiple departments running at the same time, you can create all of your projects in Z-Stream and coordinate work more effectively across all of your platforms. Quality control is one of the most important elements of your business, and you want to make sure that it doesn’t fall by the wayside. With the Quality Assurance tab, you can efficiently manage, track, and organize your software testing efforts. No extra plugins are required: keep track of key QA questions and ensure that you’re delivering the quality your customers expect right from the convenience of your app. If you’re still curious about whether or not Z-Stream will work for you, sign up for your free trial to check it out and learn how to use the features. Start using Z-Stream today to discover more about how you can take project management to new levels!